This image shows the recently discovered trans-Neptunian object 50000 Quaoar traversing through Serpens Cauda while shining at a measly magnitude 19. It was discovered on June 4, 2002 by astronomers Chad Trujillo and Michael Brown at the California Institute of Technology. Quaoar is currently estimated to be 890 ± 70 km in diameter and orbits at about 6 billion kms from the Sun with an orbital period of 287 years. 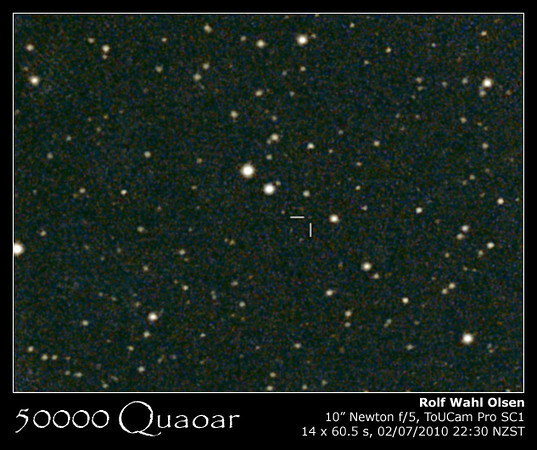 Quaoar has one known moon, Weywot, which was discovered in 2007. Weywot is estimated to have a diameter of 74 kms, orbiting Quaoar at a distance of 14,500 kms. Quaoar is the largest body that is classified as a cubewano, which is a Kuiper belt object that orbits beyond Neptune and is not controlled by an orbital resonance with the giant planet. Cubewanos have semi-major axes in the 40-50 AU range and do not cross Neptune’s orbit. The name "cubewano" derives from the first trans-Neptunian object found after Pluto and Charon: "(15760) 1992 QB1". Later similar objects were called "QB1-o's", or "cubewanos". The image is quite noisy, but this target is really at the very limit of what I could pick up with 1 minute exposures using the ToUCam. I wasn't even sure if I got it until I started processing the data.